You can refer to https://mbed.org/ for other programs if you guys want to try. This entry was posted in Boards, FRDM-K64F120M, Manya's Diary and tagged code, FRDM-K64F, KDS, Kinetis Design Studio, Kinetis SDK, LED, Library, mbed, Neomatirix by manya19. Bookmark the permalink. Why don’t you try with the uTasker project – http://www.utasker.com/kinetis/FRDM-K64F.html ? This will allow you to add your LED matrix to it simulator and simulate and debug the operation in its Kinetis K64 simulator (in approx. real-time). At the same time it will also work with KDS so you will be able to avoid complications and complete work much faster. How the Interrupt source works!? I always think its a pretty bad idea to try and import mbed libraries to bare metal projects. Isn’t mbed written in C++? It’s great if you are adopting mbed, but porting mbed to KDS does not seem introductory at all. What you have chosen to do [start from scratch] is great. I have never used Kinetis SDK. I mostly use Processor Expert, or do bare metal code based on the manufacturer’s .h file provided for the chip. Its pretty easy. Another great way of learning about the ARM architecture is to try and mix C and assembly code, like write some functions in assembly and call them in C, when you need to optimize some parts of the code. In my experience, using mbed code or project has been problematic. Same for Arduino projects. They are good as inspiration point, but I have never seen any of these projects going beyond the hobby or pre-hobby stage. I agree with Karibe: using Processor Expert or simply plain C gets me far faster to a working point, and I can use it in real and industrial projects. The Kinetis SDK has potential, at least it is plain C code. It is only that the Kinetis SDK is hard to learn and rather complex if you do not have experience with it. I have not used the Adafruit NeoPixels with the Kinetis SDK yet (and I’m even not sure if this would be possible at all). I had the NeoPixels working with Processor Expert without any issues. with the aim to understand the CPU. to and from the cpu. because you have to make so many decisions at the start. how the things work behind the scenes. and not vendor specific like the Kinetis SDK. Or is it possible to reach my aim with plain C code? to go the plain C way. And my last question, what’s the mysterious Processor Expert? from my own C code? I understand your pain: I was in the same situation a few years ago. These ARM Cortex microcontrollers are by hundreds of factors more complex than simple 8/16 microcontrollers. I grew up with 68000, HC05, HC08, HC12 and many more. But these ARM cores are much more powerful, but the same time much harder to understand and use. And even worse: the Cortex A series is even more complex. So to some extend, there is a big need for vendors like Freescale etc to provide easier way to get started. That’s why all these ‘SDK’s, ‘ware’ and similar exist. Understanding GPIO/LED toggling is a great start. But in the ARM world only the core from ARM is about the same: everything else around (GPIO, UART, I2C, …) is completely vendor specific. So if you ‘know ARM’, then you know the core instruction and things like NVIC (nested vector interrupt controller), but not all the other things. Talking about vendor specific SDK’s: there is one SDK pushed by ARM (CMSIS-DRIVER), but I do not see it getting any traction anywhere: every microcontroller vendor fears that with this he cannot differenciate from the others, so everyone (STM, Freescale, NXP, to name a few) do their own thing. The good thing is that you can do things with plain C. But again, all the peripherals are vendor specific, and not portable. Even not portable in most cases between devices from one vendor. About Processor Expert (http://www.freescale.com/ProcessorExpert): this is a tool which performs device/peripheral initialization, is able to configure drivers and to generate source code. 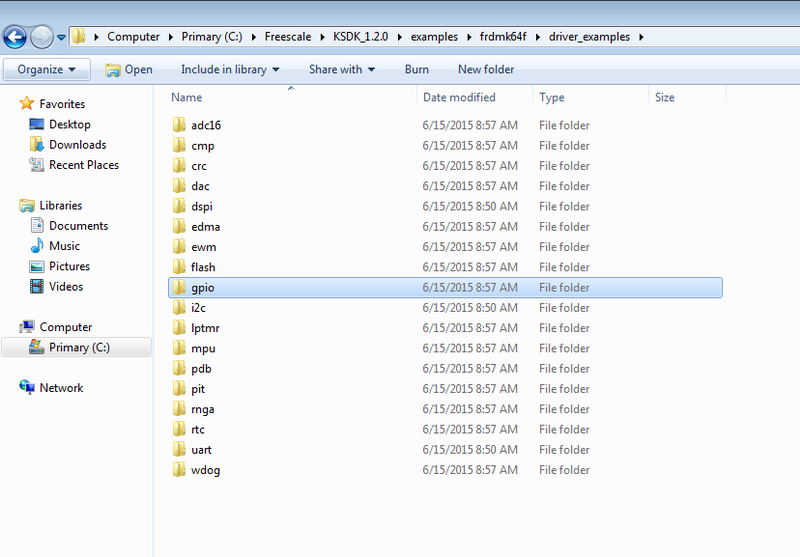 It even has a technology included which is named CDE (Component Development Environment). It is a great tool (I use it a lot), because it allows me to keep my code (at least within the Freescale world) compatible between devices. I do not need to read the reference manuals if I do not want, as long as I have a understanding how the hardware works. If you want to control and know every single bit of your device, then this is probably not what you want, because it provides an abstraction of the device. But it provides normal C source code which you can take ‘as is’ or modify for your needs. I hope this helps, otherwise let me know and I try to provide more insights. In fact the Cortex M4 is very simple (for the user) – really there are only a few registers that need to be understood. The complexity is in the peripherals that are in the chips. These can be quite complicated to control – plus there are often software protocol stacks on top of the drivers before they can actually be used. Cortex M4 code will essentially run on any Cortex M4 processor (from Freescale, Atmel, ST-Micro, Ti etc.) but the peripheral code will not and needs to be re-developed for each one. as an update, I made some progress last night. I have now the FTM0 working and it is able to trigger DMA requests to the GPIO pins. So the raw concept of driving the NeoPixels with the FRDM-K64F board is working. Now it is all about the details to get the timing right. I should be able to post an article about this shortly (I hope). It is the same concept and approach as described in https://mcuoneclipse.com/2014/11/10/neoshield-ws2812-rgb-led-shield-with-dma-and-nrf24l01/. But I had to translate this into the Kinetis SDK language. Unfortunately, using the Kinetis SDK is much more difficult and complex than using Processor Expert (as I did in that post with the FRDM-KL25Z). I know of two projects using Freescale processors, neither of which used either Kinetis SDK or Processor Expert. The other was a price-sensitive device using a KL02 processor with the coding done with just the gnu ARM compiler—no software development kit. All the SDKs (even the “bare metal arm” one) had too much crap in them, resulting in very bloated code. With only 8kB of flash, code bloat is a serious problem. The bare-metal ARM code is good to look at for figuring out how to do things like starting up the clocks though the complicated state machine. The code from the other SDKs is nearly impenetrable tangles, layered so deep that it is nearly impossible to take just a little of it. I’ve done almost all my coding with the mbed compiler, since I’m working with the KL25Z boards which have an enormous 128kB flash, which I never come close to filling.